The Australian Government has released its response to the Chief Scientist’s STEM paper and is now seeking your input – submissions close late July. 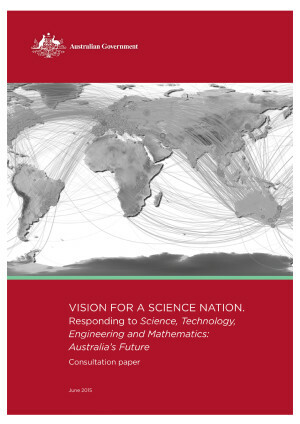 The report Vision for a Science Nation. The Minister for Industry and Science, the Hon Ian Macfarlane MP, and the Minister for Education and Training, the Hon Christopher Pyne MP, have released a consultation paper, to stimulate discussion. The paper responds to the key issues raised by the Chief Scientist, Professor Ian Chubb, in his report. Feedback on the paper will assist with the development of a national strategy to foster STEM skills and knowledge – a strategy which will support the Australian Government’s vision for a future in which Australia is a leading nation in STEM. Why is STEM important to Australia? STEM is critical to boosting Australia’s international competitiveness and national well-being. STEM knowledge and skills lead to new products, more efficient services, and a more diverse, resilient and sustainable economy. As a nation, a better understanding of science and maths will help us address national challenges and ensure that Australians can continue to enjoy good jobs, quality health care, a sustainable environment and the opportunities and services they deserve. However, STEM capabilities in Australia are at risk of falling behind those of our major international competitors and partners. STEM skills will be increasingly critical to the jobs of the future, and to meeting important national challenges – so it is important that we act now. The Australian Government has also established nine new Science and Research priorities to build capability in key areas and guide future investment in STEM.